Perhaps it was that Gino’s East was my first, or perhaps it’s the sausage patty that covers the entire pizza, but whatever the cause, Gino’s East is still my pick in the eternal best of Chicago pizza debate. (That is: Uno’s vs. Due’s vs. Gino’s vs. Lou Malnati’s. Giordano’s, with its stuffed pizza falls into a different category.) Also, this debate is how to tell whether you’re talking to someone who actually knows their Chicago style pizza—if they don’t have an opinion about which is best, and if they’re not willing to passionately, yet blindly, defend that preference at all cost, then that’s a sign that they perhaps shouldn’t be trusted to guide you on your pizza quest. 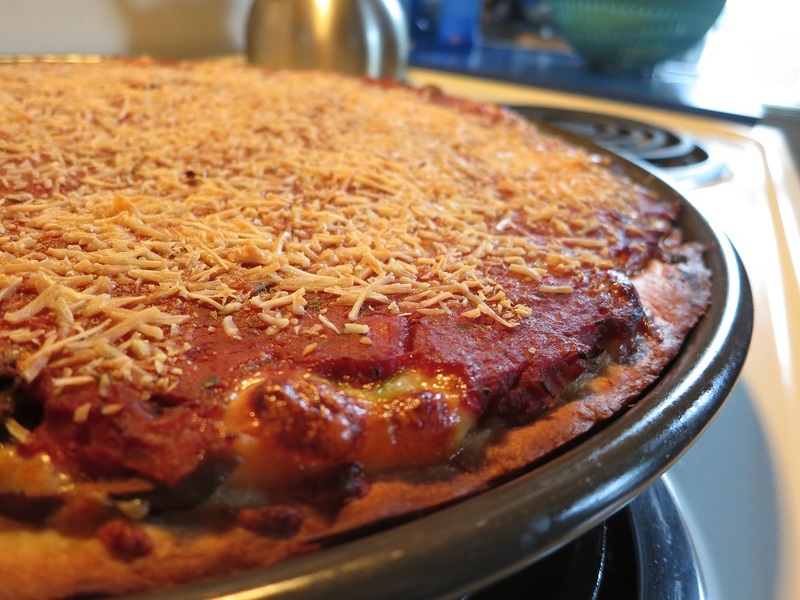 While there is great (and heated) debate about which is the best deep dish pizza place within Chicago, one thing everyone from the city can agree on is that there is no good Chicago-style pizza to be bought outside of the Chicagoland area. Yes, I know there’s a Uno’s chain. But if that’s the only place you’ve had Chicago-style pizza, I’m sorry to disappoint you: you’ve not really had Chicago-style pizza. Pizza dough — with cornmeal. 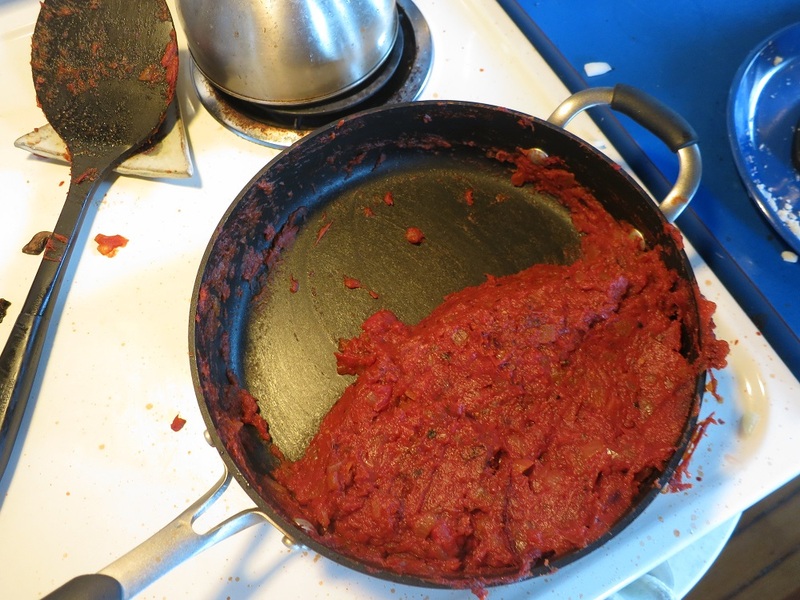 I happen to think it’s delicious, but in some camps, the presence of cornmeal is heresy. 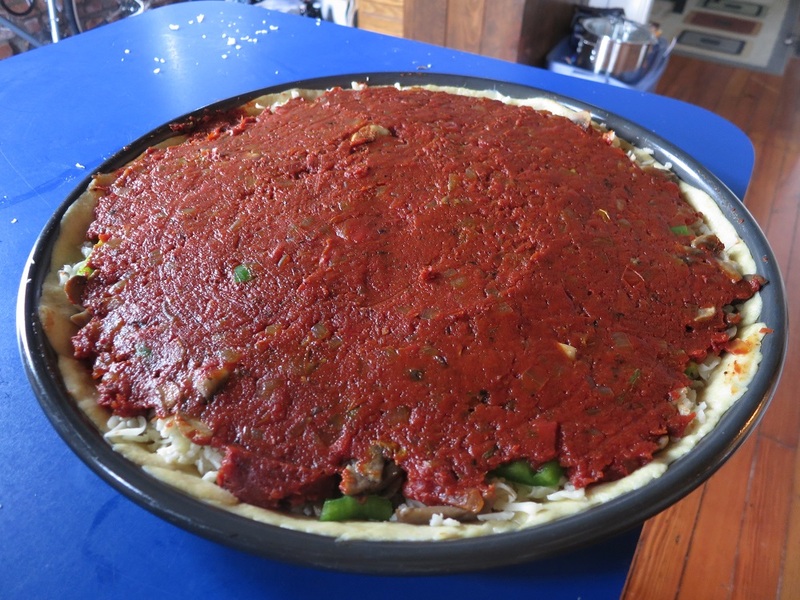 A properly assembled Chicago-style pizza. Sauce on top! 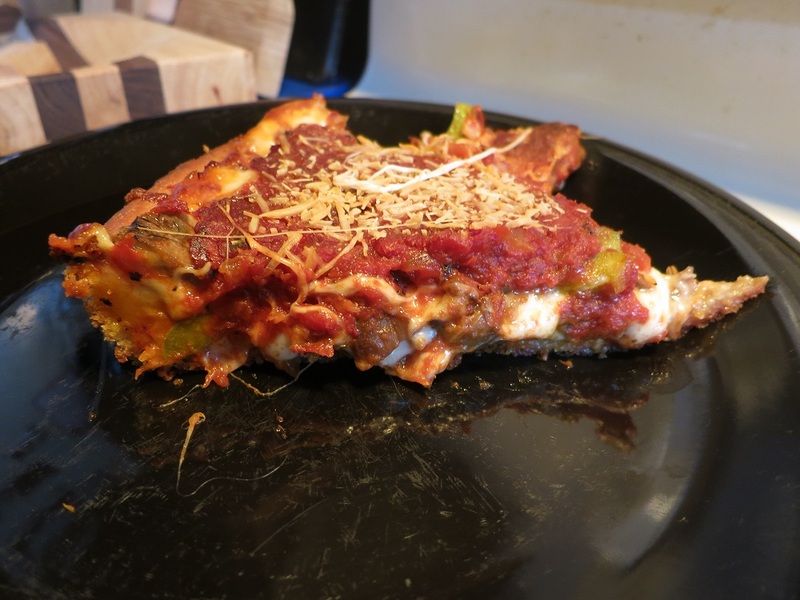 So, if finding a restaurant serving true Chicago-style deep dish is well-nigh impossible once you get too far from the Loop, what is one supposed to do? Make it yourself of course. That’s what my folks have done, and that’s what I’ve continued to do whenever I need my Chicago-style pizza fix. 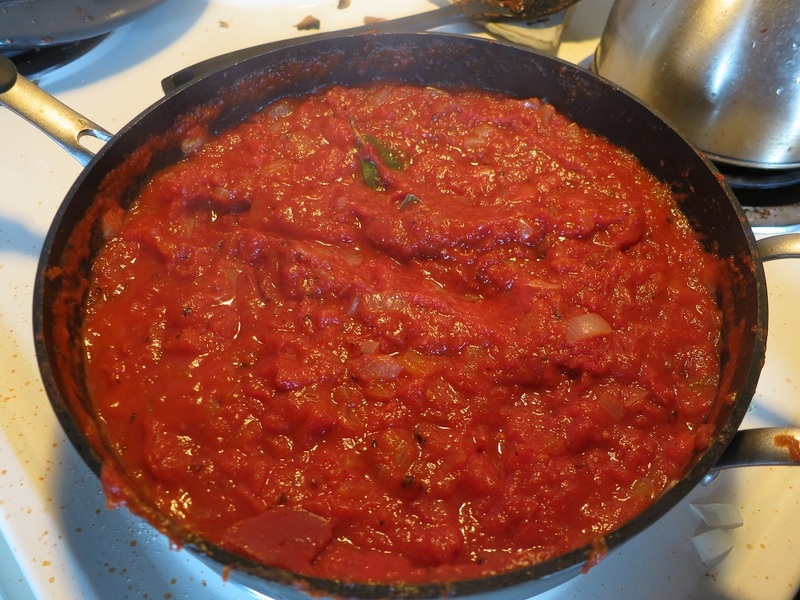 This is the recipe I currently use; it’s adapted from my traditional family recipe. Well the crust is slightly adapted anyway. The sauce is one and the same. And certainly you can add or subtract toppings as you desire. One of the beauties of pizza is that it is customizable after all. But for the most representative set of toppings (fillings if they’re not on top?) 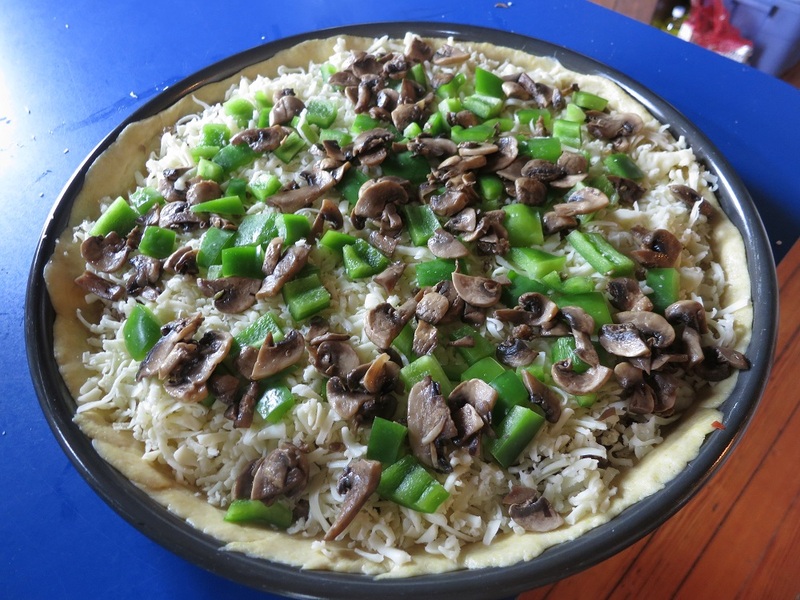 follow the list below: sausage, mushroom, and green pepper. Pizza dough ready to be filled! 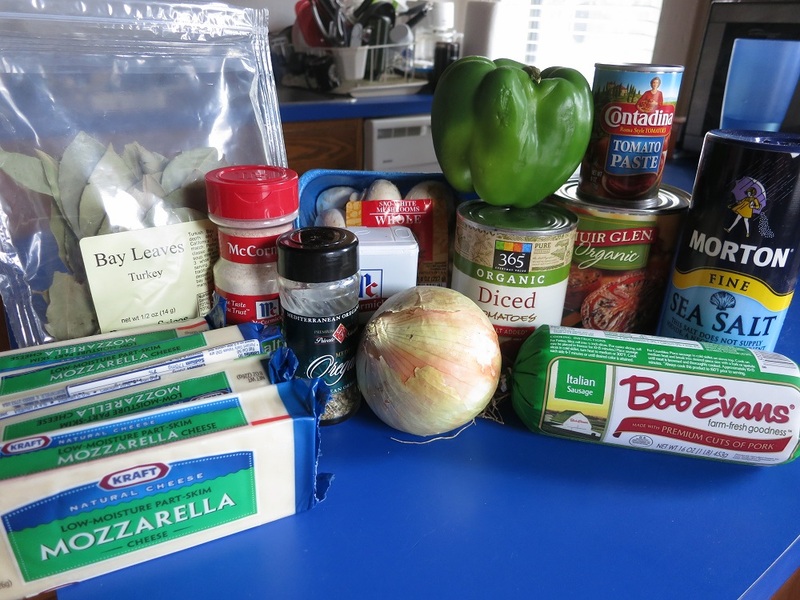 (Most of) the pizza ingredients. 2. Dissolve yeast in lukewarm water. Add to flour mixture. 3. Stir again, then add olive oil. 4. 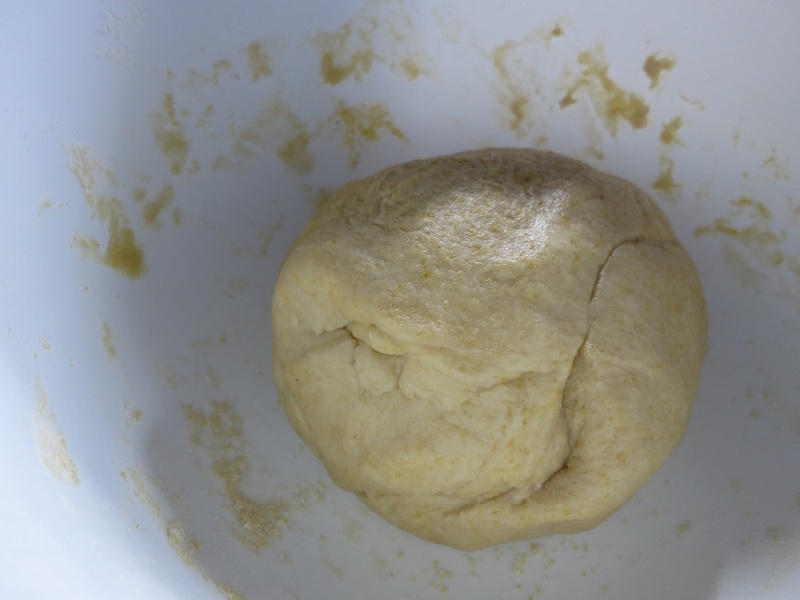 Stir until the dough mixture forms a ball in the bowl. 5. Knead the dough for 8 to 10 minutes add then place ball of dough in a covered bowl. 6. Allow to rise in a warm, draft free place for two hours or until dough has approximately doubled in size. The beginnings of the sauce. 1. Saute onion in olive oil over medium heat until transparent. 2. Add remaning ingredients (except orgeano), stirring well. 3. Simmer uncovered for 45 minutes, stirring occasionally. 4. Add oregano and continue cooking for 15 minutes. 5. 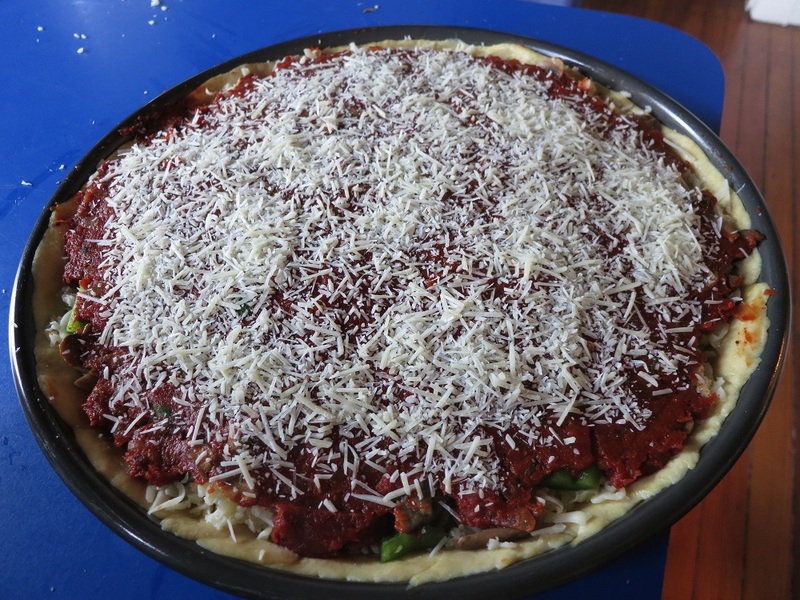 Remove bay leaf, spread evenly over pizza. 1. 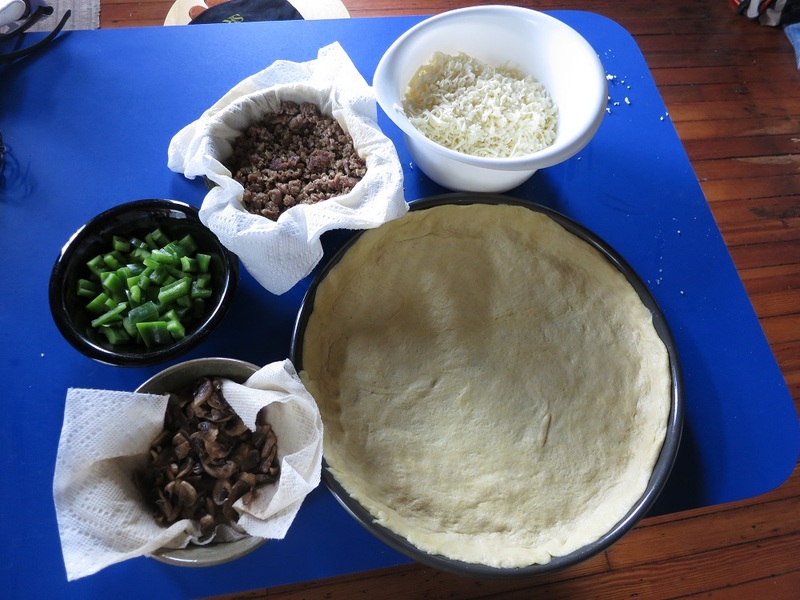 Roll out dough to form a circle slightly larger than the size of the pan. 4. Sprinkle on the Parmesan cheese. 5. Bake in a preheated oven at 450 degrees for 25 minutes or until crust is golden brown.